A #1 Amazon Charts bestseller. 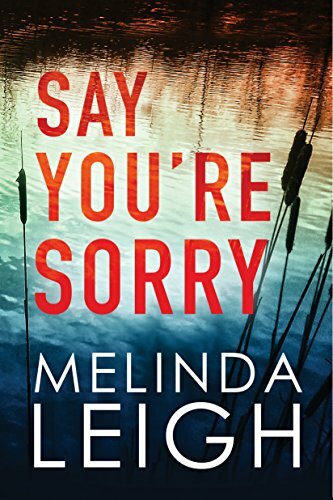 I just now finished “Say You’re Sorry.” This book kept me awake as I couldn’t put it down. I’ll write a review (or try to). The book was so good I’m not sure I’ll do it justice…but I’ll try. I fell in love with the characters…and wonder of wonders I didn’t figure out who the culprit was until the author wanted me to. Most of the time I can figure it out but not this time. There was never a dull moment. I wish I didn’t have to wait until September for “Her Last Goodbye” to see what Morgan Dane and Lance Kruger have to deal with. I loved this book. It was a thriller from beginning to end. Since it is Book 1 of the Morgan Dane series, if it gets better, or more thrilling, from here I won’t be able to read them at night. As I told Mollie, my granddaughter, who sent me a text yesterday (5/15/17) telling me the paper she wrote for English (and which I edited) netted her a 100, I love it when a teacher recognizes a perfect paper when she reads one. This is a 100 book. Morgan Dane is an attorney who has had a stellar career as a deputy prosecutor. She and her husband, a military man stationed in Iraq, have three young daughters. Then, Morgan finds herself a widow responsible for raising her three young girls alone, Struggling to cope, she returns home and moves into the house with her father. She has finally decided it is time to go back to work and has agreed to work in the local prosecuting attorney’s office. Then the young girl who occasionally babysits for her is found dead and their neighbor, Nick, the teenaged boy who plays chess with her dad and reads bedtime stories to her girls, is accused of the murder. Since Nick and his father don’t have the money to hire a competent attorney, they ask Morgan to represent him. She realizes this is the other side of the “legal aisle” from the job she just said she would accept, but she feels compelled to do it. This story has it all. A crazy killer, a young murder victim, whose last words to the grandparents who have raised her since her parents died were angry words, a young boy who lives with his father and helps with his dad’s landscaping business, and who has never shown any criminal tendencies, but is now accused of murder, a missing teenaged girl, and a private detective hired to look for a missing teenager – there are connections between the missing girl, the dead girl, and the former prosecuting attorney who is now considering representing the accused murderer. Melinda Leigh is great at writing thrillers with a touch of romance. If you like mysteries, you’ll love this book. If you like a human-interest story with a touch of romance, you’ll love this book. If you like reading, you’ll love this book. I can’t recommend it highly enough. I had NO idea who did it! I was wrong all the way to the end! LOL This was such a well done story, I truly am in love with Morgan Dane. She is one bad little mama. Talk about an underdog coming out on top. I loved the balance of chaos and reflections that were in this story. You literally have to keep turning the pages, or listening to the book. I was hooked, as usual, from the first pages. This story has many layers, like an onion. Just when you think you know what is, or has happened Melinda throws an acorn under your feet and you trip into something new. Which, I for one absolutely love! Morgan is tasked in saving her neighbor’s kid from being convicted of a crime he didn’t commit. (Or so they think. It’s all a big pile of who done it, and why’d they do it.) With the help of Sharpe Investigations Morgan starts to unfold the layers of the story. What is the truth, and what is lies starts to get blurry…and just when you think something is settled, the case is done for… BAM! Things get intense and I swear my eyes bugged a few times. Why? Cause I had it all wrong!!!! LOL That is what reading a Melinda Leigh book does to you. Its fantastic to say the least!